The U.S. General Services Administration will dedicate its first exterior sculpture at the 624-acre Denver Federal Center on September 15. 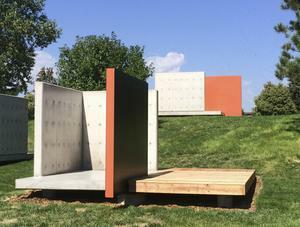 The sculpture consists of eight identical "platform pavilions," each consisting of both vertical and horizontal panels, forming an area that evokes an open room, and a wooden surface that suggests a wrap-around deck. Zittel's group of structures functions as both abstract sculpture as well as a flexible, modular environment that can be used in various ways, including casual social gatherings or places to sit, relax and view the surrounding landscape.